In "Anther Rubbing, a New Mechanism That Actively Promotes Selfing in Plants", Abdelaziz et al. 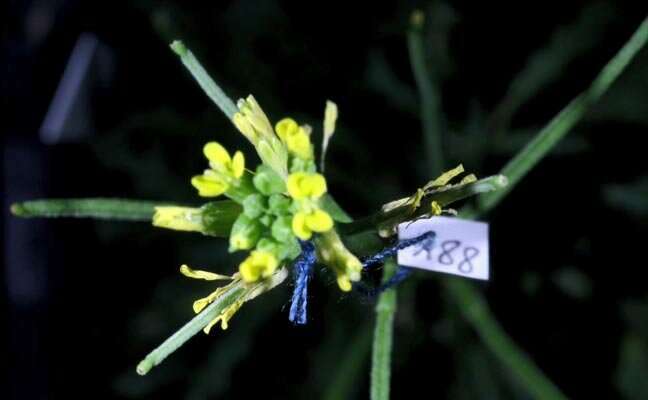 describe anther rubbing, a mechanism based in autonomous, repeated, and coordinated movements of the stamens over the stigma during flower opening that promotes self-fertilization in a Brassicaceae species. The researchers use time-lapse video and micro-photography to document this novel reproductive mechanism. They also demonstrate experimentally that anther rubbing is sufficient to achieve maximal reproductive output in this plant. This mechanism is different from the known cases of delayed self-pollination because it assures self-pollination even before the flowers will be exposed to the visit of pollinators. This work demonstrates that elaborated mechanisms, including continuous and repeated movements, can evolve in plants to promote self-pollination. Since the evolution of mating systems in plants is a very active research field, this work will establish a new perspective in the study of the evolution of plant diversity and their mating system strategies.